1. 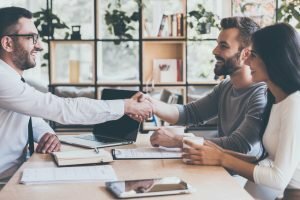 How does the process work when selling my land to you? The process is very simple. You can either fill out the fast offer form or give us a call to give us information about the land you want to sell. If the land is one that would fit our investment criteria, we will call you with a cash offer. When we come to an agreement on a price, we will take care of everything. We pay all closing costs and even pay a notary to bring the documents to you for your signature. 2. Do you buy land that needs a lot of improvements? Of course. In fact, most properties we buy need improvements. Those are the ones we actually prefer. Don’t worry about any level of improvements. We can handle anything. 3. Do you buy land that does not need any improvements? If you have land that does not need improvements, don’t worry, We buy those properties, too. 4. How long does it take to get an offer from you? We can usually make you an offer in 1 to 2 days. If absolutely necessary, we can close in as fast as 3 days. Typically, we schedule closing for 10 business days but are willing to make it convenient for you. So whether you want to close within a week or a month, we can usually accommodate it. 6. Are there any fees if i sell my land to you? We do NOT charge fees to buy your land. We make our money with the investment and do not need to make more by charging you a commission. 7. If I request an offer from you, am I obligated to sell you my land? Absolutely not! You have nothing to lose. It doesn’t hurt to see what we can offer you for your land. So why not give us a call? We will happily answer your questions with absolutely NO PRESSURE to buy or sell. 1. I want to purchase land. What are my options? We have several easy payment options, depending on the size and price of the property: 1. Pay the Buy Now price and save. A. By credit card through Bill & Pay, our invoicing system B. By cashier’s check via mail C. By cashier’s check via a traveling notary 2. Pay in installments. There are no requirements, fees, or interest. We will send you monthly invoices through Bill & Pay. Then you may pay: A. By credit card after logging into Bill & Pay, or B. By check via mail. **Please note: Not all properties are available to be purchased in installments. 2. When will I receive the deed to my new property? You should receive your deed within 3 days of payment processing. If you are paying in installments, the deed will be sent after the FINAL payment. We send each deed via Priority Mail with a tracking number. 3. What should I do after receiving my deed? The deed you receive from us (whether via mail, email, directly from a traveling notary) will be a COPY. We will send the ORIGINAL deed directly to the county and pay any filing fees. After processing, the county will send the ORIGINAL filed deed directly to you. This usually takes about 2 weeks. In other words, just sit back and relax. We will do all of the work for you!